Yu Darvish pitched sparkling ball into the seventh inning, Chris Taylor homered again and the Dodgers beat the Chicago Cubs 6-1 to open a 3-0 lead in the NL Championship Series. 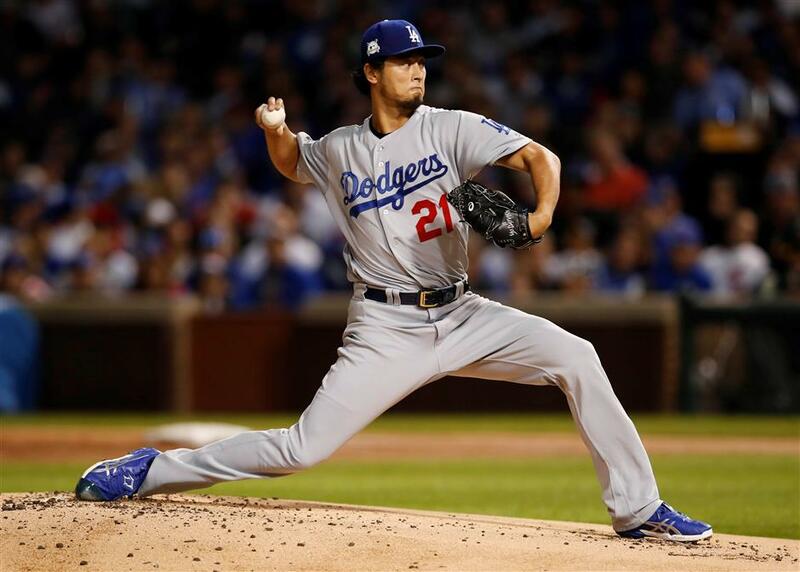 Los Angeles Dodgers starting pitcher Yu Darvish throws a pitch against the Chicago Cubs in the first inning during Game 3 of the National League Championship Series at Wrigley Field in Chicago, Illinois, on October 17, 2018. Yup, it's beginning to look a lot like 1988. Yu Darvish pitched sparkling ball into the seventh inning, Chris Taylor homered again and the Dodgers beat the Chicago Cubs 6-1 on Tuesday night to open a 3-0 lead in the National League Championship Series. Andre Ethier also went deep and Taylor added an RBI triple in the fifth as Los Angeles improved to 6-0 in this postseason, setting a franchise record for consecutive playoff wins. Yasiel Puig had two more hits in another entertaining performance that included an impressive bat flip — on a long foul ball in the first inning. "The focus has certainly been heightened in the postseason," manager Dave Roberts said. Looking for a four-game sweep and their 22nd pennant, the Dodgers will send Alex Wood to the mound on Wednesday night (Thursday morning China time) at Wrigley Field with a chance to reach the World Series for the first time since Hall of Famer Tommy Lasorda managed Kirk Gibson, Orel Hershiser and Co. to the club's last championship 29 years ago. "I think we've won four games in a row before," Chicago slugger Kris Bryant said. "Obviously, it's going to be a tougher road. But it'll make the story that much better. Can you imagine that?" "I really didn't change much approach-wise from first inning until the end of the game," Darvish said through a translator. "I just kept pitching the same way." Making their third straight appearance in the NLCS, the weary Cubs also hurt themselves with a couple of big mistakes. Carl Edwards Jr walked Darvish on four pitches with the bases loaded and two outs in the sixth, continuing a rocky postseason for the reliever and leading to a round of boos from a frustrated crowd of 41,871. Darvish departed after striking out Addison Russell in the seventh, pausing for congratulations from his whole infield before heading to the dugout. The Japanese right-hander allowed six hits, including Schwarber's first-inning homer, in his second career playoff win — both this year. He struck out seven and walked one. Tony Watson got two outs, Brandon Morrow worked the eighth and Kenley Jansen closed it out after Ross Stripling gave up two hits in the ninth. With Roberts pushing the right buttons, Los Angeles' bullpen has yet to allow a run in the series. "I think everybody's just been attacking," Morrow said. "That's the No. 1 thing." "We knew today was the most important game, and now tomorrow's the most important game," Ethier said. "We're going to come out and figure out how to get the job done again." Schwarber's sixth career postseason homer got Chicago off to a fast start, but Jon Jay struck out with two on to end the inning. The Dodgers responded with Ethier's leadoff drive in the second and Taylor's second homer of the series in the third, a mammoth shot to center off losing pitcher Kyle Hendricks. "We had a chance obviously, early," Maddon said. "We hit some balls well early in the game, and then he settled in." Ethier had two hits in his first start of this year's playoffs after he missed most of the season with a herniated lumbar disk. Taylor also had two hits and is 4 for 14 for the series, helping make up for the loss of All-Star shortstop Corey Seager to a back injury.